Weather Clock with Time, Temperature and Humidity. Dimensions are 13.75 in. by 10.75 in. This triple function desk clock shows time, temperature and humidity. Your logo can be printed directly onto the face of each clock. The minimum order quantity is 25 pieces. 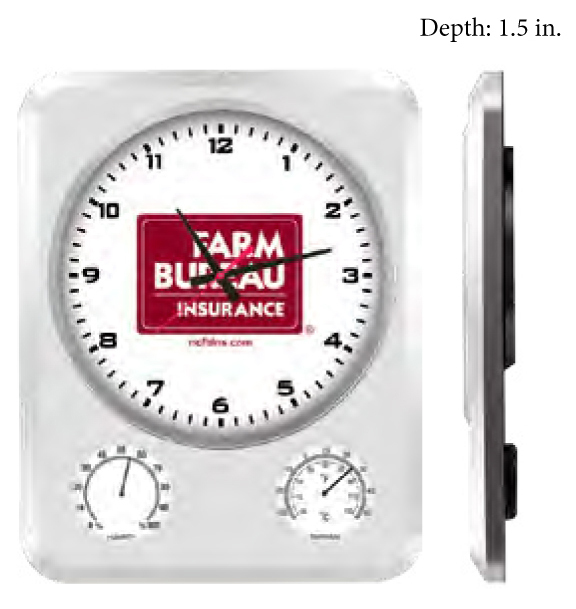 This promotional desk clocks are popular for giveaways and corporate promotions. People can place the clock on their desk or countertop and see your logo throughout the day. These are well built clocks with a glass lens for each window. If you are looking to buy a weather clock for your promotion, we encourage you to order a sample for evaluation. The clock dimensions are 13.75" by 10.75".